Babel Buster network gateways are used to connect smart devices to networks other than the network they were designed for. 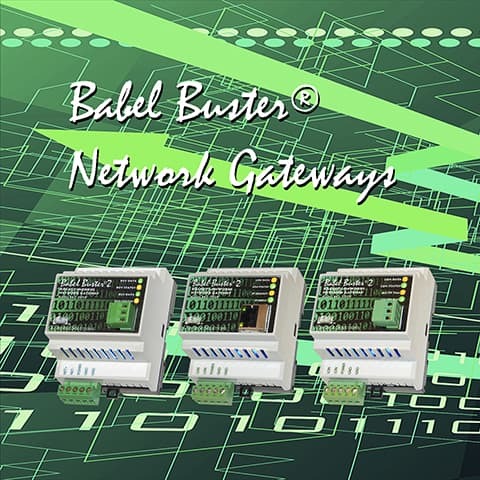 Babel Buster gateways provide support for building automation with BACnet, LonWorks, Modbus, and WiFi sensor protocols. Babel Buster gateways also support data centers and IT infrastructure with SNMP. Control Solutions strives to make these gateways as easy to use as possible, and strivse to make them the most cost effective gateways available. Simply listing two protocols does not fully define a gateway. There is no totally transparent, direct translation between Modbus registers and BACnet objects. This becomes even more evident with structured LonWorks network variables where a single "data point" translates into multiple BACnet objects or multiple Modbus registers. (1) What protocol is on the network? (2) What protocol is in the device? Then use that information as you follow the selection guide below. My NETWORK is one of the following, which gateway do I need for my device? Babel Buster Pro V210 will function as an SNMP Manager (or client) enabling access to SNMP devices by Modbus devices. Mappings you configure will read OIDs from the MIB of other SNMP devices, and store that data in Modbus registers inside the Babel Buster Pro. Your Modbus master may then poll those registers. Optionally, you may configure the Babel Buster Pro as a Modbus master, and add additional mappings to cause it to write data to other Modbus slaves (or read data from those slaves if applicable). The Modbus-SNMP data exchange is bi-directional, so Modbus can also cause data to be Set in other SNMP devices. The standard models that provide Modbus to Modbus connectivity are all "mapping" gateways. This means you configure register maps that will result in the gateway polling other Modbus devices, and storing a copy of their data in local registers inside the gateway. The gateway will typically be operating as master on one side and slave on the other side, or sometimes as slave on both networks. Not only do you have the means to relocate registers, but you have the means to make multiple RTU devices appear as one TCP device, or vice versa. The -GW suffix in the model number signifies "transparent gateway" meaning data packets are passed through "transparently" with no interpretation of the data by the gateway. It might also be thought of as a Modbus router, although it does not contain packet forwarding across multiple logical network numbers as found in BACnet. No such definition exists in Modbus. Babel Buster Pro V210 will function as a Modbus TCP client (master) or server (slave), and as a Modbus RTU master or slave. The Babel Buster Pro will automatically poll other Modbus devices, or if configured as slave, other Modbus masters may write to registers in the Babel Buster Pro. The Modbus data is mapped to the gateway's internal MIB. SNMP managers may Get the Modbus data, or Set to result in writing to Modbus registers. My DEVICE is one of the following, which networks can I connect to? Babel Buster Pro V230 will function as an SNMP manager (client) or SNMP agent (server). As an agent, the MIB within the Pro V230 is mapped to BACnet objects you select in the Pro V230. As a manager, the Pro V230 will use SNMP Get and Set requests to interact with other SNMP devices, sharing data found using the BACnet objects in the Pro V230. The BACnet objects may be accessed by other BACnet devices using standard BACnet Read Property and Write Property requests. In addition, you may set up mappings to cause the Pro V230 to read/write BACnet objects in other BACnet devices and make that data available to SNMP. Babel Buster Pro V210 will function as an SNMP Manager (or client) or SNMP Agent (server). Babel Buster Pro will also function as Modbus TCP client and server. The Babel Buster Pro can Get/Set data in other SNMP devices, or other SNMP managers can Get/Set data in the Babel Buster gateway. The gateway can also be configured to read/write Modbus registers in other Modbus TCP devices, or other Modbus TCP clients can read/write local registers in the gateway. Babel Buster Pro V230-SP will function as an SNMP Manager (or client) or SNMP Agent (server). Babel Buster Pro will also function as BACnet IP client and server. The Babel Buster Pro can Get/Set data in other SNMP devices, or other SNMP managers can Get/Set data in the Babel Buster gateway. The gateway can also be configured to read/write BACnet objects in other BACnet IP devices, or other BACnet IP clients can read/write local objects in the gateway.